For me, spring and summer are the perfect time for simplicity. Time for relaxation over long, lazy meals al fresco and good conversation. And dessert should be equally simple and fresh. So during these months, I like to emphasize fresh fruit and unfussy pastries and rustic desserts. If you're a lemon fan, you’ve probably already discovered Ina Garten’s Lemon Yogurt Cake. 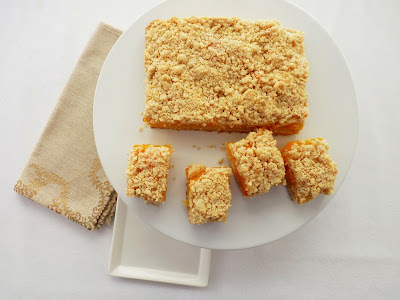 It’s a luscious cake with great lemon flavor and a beautiful crumb, a recipe that works for lots of different applications. It’s delicious all by itself or alongside your favorite fruit. Here I reach for the new delivery of bright red cherries, among the very best gems at the market. Let's hope this year provides us with a bountiful crop. The cherries this season are terrific. Here I’ve prepared them with some sugar, orange zest and a splash of balsamic to lend a note of acidity and brightness. A quick simmer on the stove softens them to a tender juicy bite. Lemons and cherries, definitely a winning combination. Happy spring! - Fresh cherries don’t need much sugar. Sweeten to your own taste and add balsamic a bit at a time until the compote has just enough of an acidic pop. 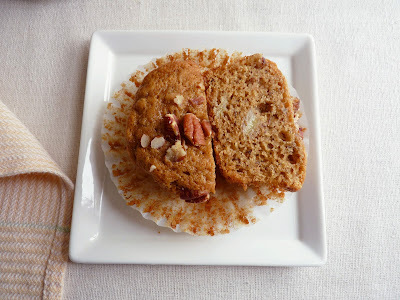 - The original cake recipe calls for an 8 1/2” x 4 1/4” x 2 1/2” loaf pan, so you can prepare this as a loaf cake if you wish. Bake for about 50 minutes. - Garten soaks the cake with 1/3 cup lemon juice and 1/3 cup sugar that has been boiled to dissolve the sugar. Then she garnishes it with a glaze of 1 cup powdered sugar and 2 tablespoons lemon juice. I just used a lemon simple syrup. Preheat the oven to 350 degrees F. Lightly grease an 8” x 2 1/2” cake pan and line the bottom with a round of parchment. For the cherry compote, pit the cherries and place them in a saucepan with the sugar and the orange zest. Cook over low heat until the juices begin to flow. Add the balsamic vinegar and a few grains of salt and cook just until the cherries are tender. Take off the heat and let cool while you prepare the cake batter. In a separate bowl, whisk together the yogurt, sugar, eggs, lemon zest, and vanilla. Slowly whisk in the flour mixture. Using a rubber spatula, fold the vegetable oil into the batter until thoroughly combined. Pour the batter into the prepared pan. Bake until a tester placed in the center of the cake comes out clean, about 28 – 30 minutes. While the cake is baking, make the glaze by bringing the lemon juice, water and sugar to a boil until the sugar is dissolved. Set aside. Place the baked cake on a wire rack to cool for 10 minutes. Invert the cake and remove the pan. Gently remove the parchment paper. Invert the cake again so it’s right side up and place on a wire rack that has been set on top of a sheet pan. Slowly pour the glaze over the cake and allow it to soak in. Cool the cake completely. 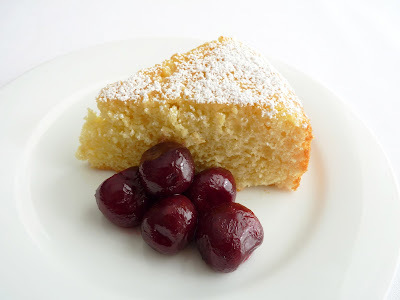 Garnish the cake with a sprinkle of powdered sugar and serve with the cherry compote. Despite our very gloomy local weather, another thrilling apricot season has arrived. And, as luck would have it, my first purchase of apricots is gorgeous. They are a good size with a beautiful ripened color, great texture and wonderful flavor. I am blissed. My first project of the season is Apricot Oatmeal Bars. With fruit this good, I like to veer in the direction of keeping things very simple. These are very easy to prepare and are more like a slice of easy crumbly pie. I add oatmeal to the pastry because I am an oatmeal freak and wanted to pair off two of my favorite ingredients in a happy marriage of pastry deliciousness. The apricots are simmered for just a few minutes with sugar and honey to coax out their juices. The whole batch is baked in no time, a very good beginning to this season of plenty. People, do not forget that apricot season is hideously, devastatingly brief, so do not waste your time ruminating about it. Get yourself to the market, STAT! - As they simmer, taste the apricots for sugar. Baking does bring out their tartness, so add enough to take it right up to your preferred level of sweetness. - Don't let the fruit boil. Keep the apricots at a low simmer to preserve their flavor. Cook them just long enough so they’re softened and pliable, not mushy. They can be made a day or two ahead. Store in an airtight container in your refrigerator. - For the apricots, I just used a piece of vanilla from my vanilla sugar jar, where I keep all my used pods. If you don’t have any, you can substitute 1/4 teaspoon vanilla extract. Add once you take them off the heat. - Rinse your vanilla pods and dry. Add to a jar of sugar to hold for future use. Both the sugar and the pods can be used again and again. - This crust/topping is crisp and very crumbly. If you prefer a chewier version, change up the flour/oatmeal ratios, substitute some brown sugar and add some baking powder as follows: 1 cup (5 oz) flour + 1 3/4 cups (5 1/4 oz) oatmeal; 1/4 cup + 2 tablespoons (2 3/4 oz) granulated sugar + 1/4 cup (1 3/4 oz) brown sugar; and 1 teaspoon baking powder. - I used old-fashioned oatmeal rather than quick oats. 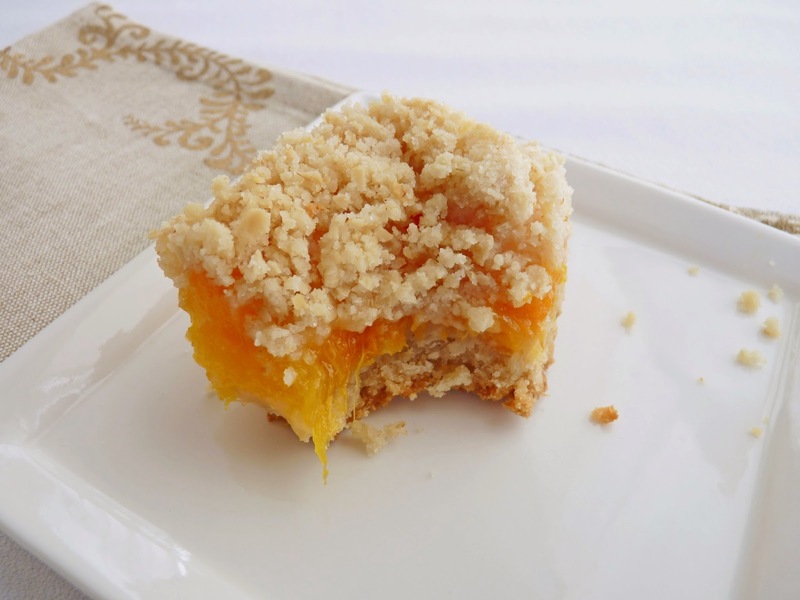 - If you’re a fan of cinnamon, add a pinch to the topping and/or the apricots. It’s a great flavor combination. 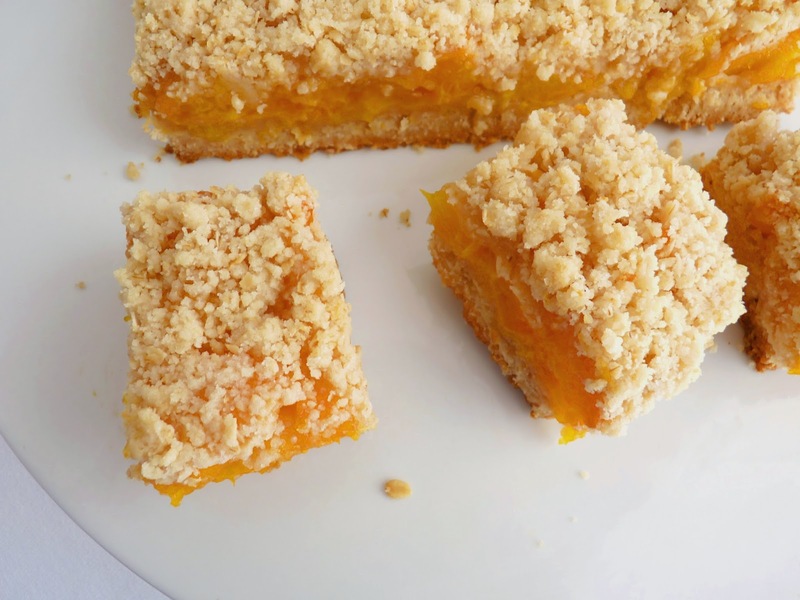 - More apricot bliss: Apricot Almond Upside Down Cake, Apricot Swirl Cheesecake Bars, Apricot Galette, Apricot Cornmeal Crumb Tart, Cornmeal Cake with Apricots. - If you have an ice cream maker, save your apricot pits and make the unforgettably sublime Noyau Ice Cream. Preheat oven to 350 degrees F. Lightly grease an 8” square pan and line with a piece of parchment paper large enough to form an overhang along two sides of the pan. Cut the apricots into 1/2" slices. Place them in a saucepan along with the sugar, honey and water. Split and seed a 1/4 portion of a vanilla bean and add the seeds and the pod. Cook on low heat for about 5 minutes at a slow simmer or until the apricots just begin to become tender. Take off the heat and cool. Remove vanilla pod. Combine the flour, oatmeal, salt and sugar in the bowl of a food processor. Process until ingredients are combined and the oats are chopped up a bit but not ground completely. Cut the cold butter into 1/2” pieces and add to the dry ingredients along with the vanilla. Pulse until the mixture starts to clump. It should remain a bit loose but hold together when pinched. Pour into a bowl and toss with your hands. Press about 2/3 of the oatmeal mixture into the prepared pan to form an even bottom layer. Bake until the surface is puffed up and looks dry and slightly browned, about 15 – 20 minutes. Pour the simmered apricots on top and spread to within 1/4” of the edges. Top with the remaining crumb mixture, making sure to distribute to the edges and the corners to form a border. Press down gently to secure. 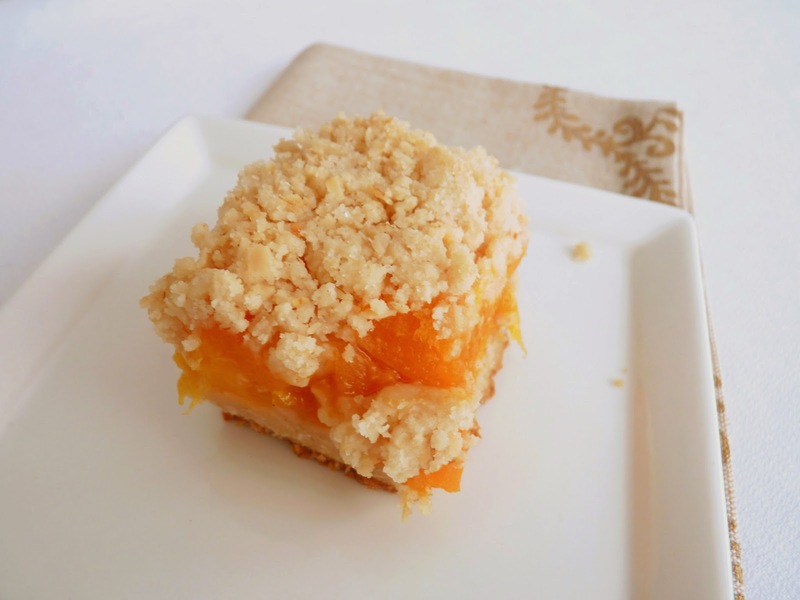 Bake until the crumb topping is lightly browned around the edges, about 20 - 25 minutes. Place the pan on a wire rack to cool completely. Run a thin knife around the edges and gently lift out of the pan using the parchment overhang to assist. Cut into bars. There are some times when you feel like experimenting and then there are times when you just want to know that a recipe is perfectly reliable and meets all your expectations. This is one of those recipes. This is a fabulous cookie from Joanne Chang, owner of Flour bakery café in Boston’s South End and author of three cookbooks. In the last few years, she’s expanded to four bakeries throughout Boston. 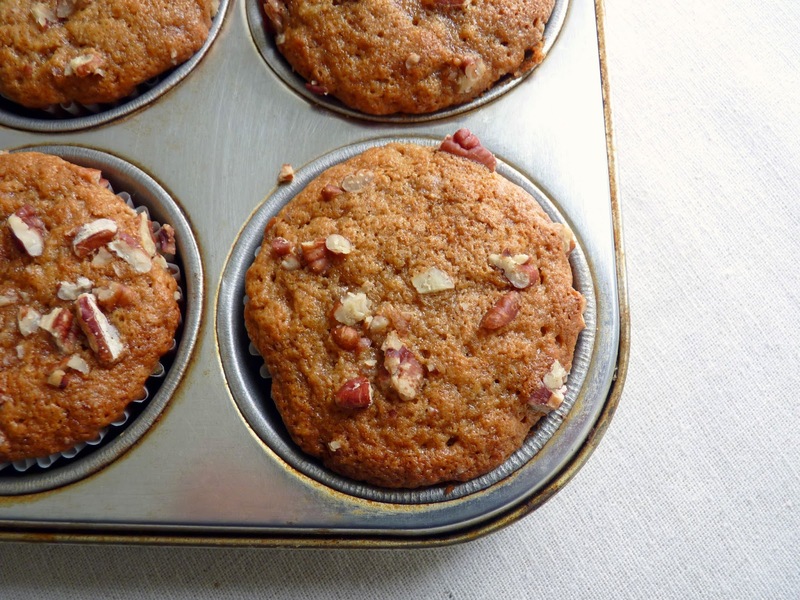 Baking with Less Sugar is her latest cookbook. Needless to say, she's earned quite a reputation. This is a simple cookie dough infused with the flavor and texture of toasted pecans and brightened with a small dollop of raspberry jam. The cookie is crisp and light. The tart jam acts as a delicious foil for the butter and nuts. I fudged a bit on the preparation by mixing the dough in a food processor rather than using the creaming method in a stand mixer. If you’d rather follow Joanne’s precise directions, just follow the link below to the original recipe. These cookies are really wonderful. 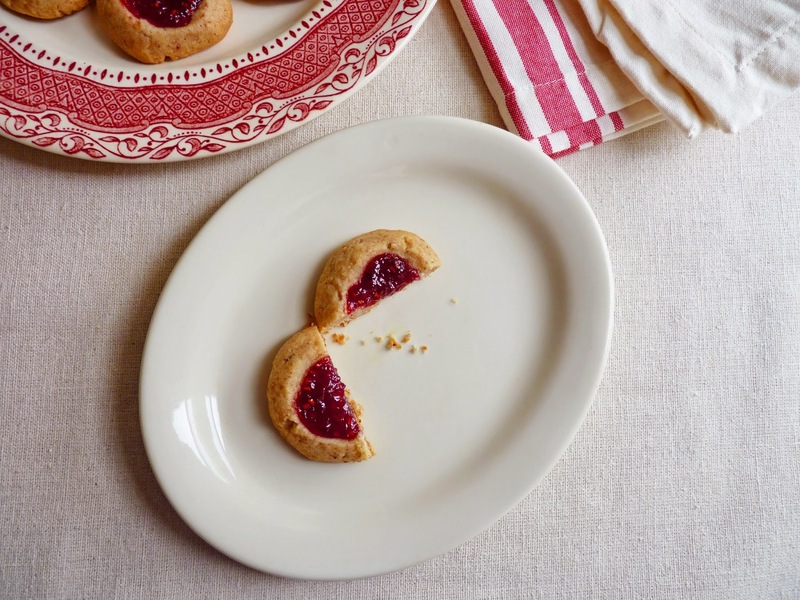 I love the combination of nuts and raspberries and this cookie does a great job of promoting both. They’re delicate and crumbly with just a hint of sweetness. This is a recipe you’ll definitely want to promote to your favorites list, not only handy for the holidays but available whenever you’re in the mood for a super delicious bite. - Joanne Chang’s weights for flour, pecans and powdered sugar are very different from mine. I went with all her formulations and those are presented in the recipe below, with the weights first. - Toast pecans in a single layer on a baking sheet in a 350 degree oven for about 10 minutes. 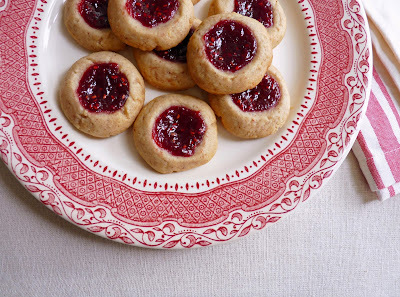 - I use a measuring 1/2 teaspoon to make the “thumbprint.” That makes them pretty uniform and perfect for the 1/2 teaspoon of jam. - This recipe makes a lot of cookies. I got about a dozen more than the 4 dozen the recipe states. The cookies can be stored in an airtight container for 3 - 4 days. 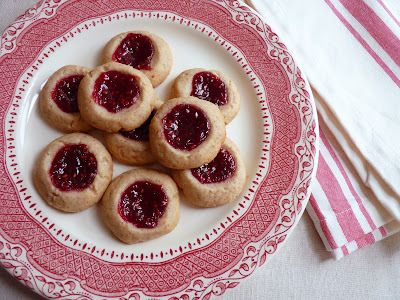 They will soften over time because of the jam filling. They are still delicious but if you want crisp cookies, I recommend making a half batch. Preheat oven to 350 degrees F. Line baking sheets with parchment or silpats. Roll the dough into 1 1/4” balls and set them about 2 inches apart on the cookie sheets. Press your measuring 1/2 teaspoon or your thumb gently into the middle of each ball to make a well for the jam. Stir the jam to loosen it and then spoon about 1/2 teaspoon into the wells. Bake until the cookies are golden brown, about 17 - 20 minutes. Place the pans on a wire rack to cool. I seem to be focused on brunch lately and this is another very easy and delicious entry. 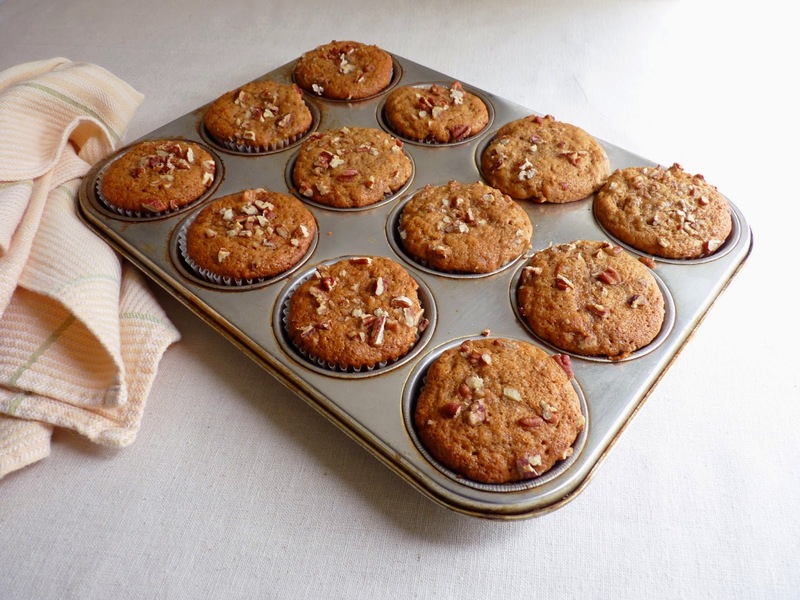 If you love Banana Bread, these muffins are a super good mini-version that will definitely more than satisfy your craving. 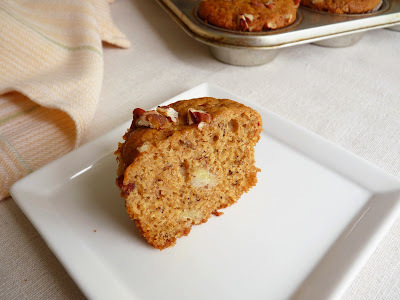 My recipe combines both all-purpose and whole wheat flour in equal parts, a dash of maple syrup in addition to both granulated and brown sugars and some cinnamon and nutmeg to spice up the mix. The butter is browned for an extra flavor boost and a small amount of sour cream adds tenderness. Lastly, the muffins are topped with a few chopped pecans for a bit of nutty texture. Once your butter is browned, this is a very quick project that comes together with a bowl and a whisk. You’ll soon have something to enjoy on a lazy weekend or as a comforting partner for your afternoon refreshment break. They also pack very well for a picnic. 1) Use a stainless steel pan to best gauge the color of the butter as it starts to brown. Have a small heatproof bowl near the stove so you can immediately pour off the butter when it's done. 2) Cut the butter into small pieces so it melts consistently without spot scorching. 3) Use medium to medium low heat and watch it carefully. As the butter starts to melt and heat up, you'll notice small bubbles on the surface that get larger. Lift the pan and swirl the butter for more control if it’s browning too fast or nearly done. You'll notice the milk solids starting to brown on the bottom of the pan very quickly. Keep your eyes on this and keep swirling. It will be done very quickly after you notice the first brown bits on the bottom of the pan. Stop when you think it's almost there and just as it begins to smoke. It will continue to brown off the heat, so pour immediately into a heatproof bowl to stop the cooking. Set aside to cool. 4) If you've gone too far, it will look very dark and taste bitter, so you'll have to start over again. You’re looking for medium amber brown. 5) When adding the browned butter to the rest of the ingredients, include all the brown bits that have settled to the bottom of the bowl. - Let the browned butter cool a bit then add the sugars. And then you'll want it to be cooled down enough before you add the eggs. - I’ve found that sour cream works best to really tenderize banana pastries. - For easy transfer, use an ice cream scoop to portion the batter. Preheat oven to 350 degrees F. Line 14 wells of standard muffin pans with paper cups. Sift both flours, salt, baking powder, baking soda, cinnamon and nutmeg. Set aside. Brown the butter until it’s medium amber. Immediately pour into a heatproof mixing bowl large enough to hold all the ingredients. Let it cool for a few minutes, then add both sugars and maple syrup. Beat in the eggs and vanilla extract and mix thoroughly. Add half of the flour mixture and stir to combine. Blend in the bananas and sour cream. Add the remaining flour mixture and mix just until there are no more flour streaks. Portion the batter equally in 14 muffin wells. Sprinkle chopped pecans on top. Bake until a golden brown and the tops spring back when lightly touched, about 20 - 22 minutes. Place pans on a wire rack to cool. 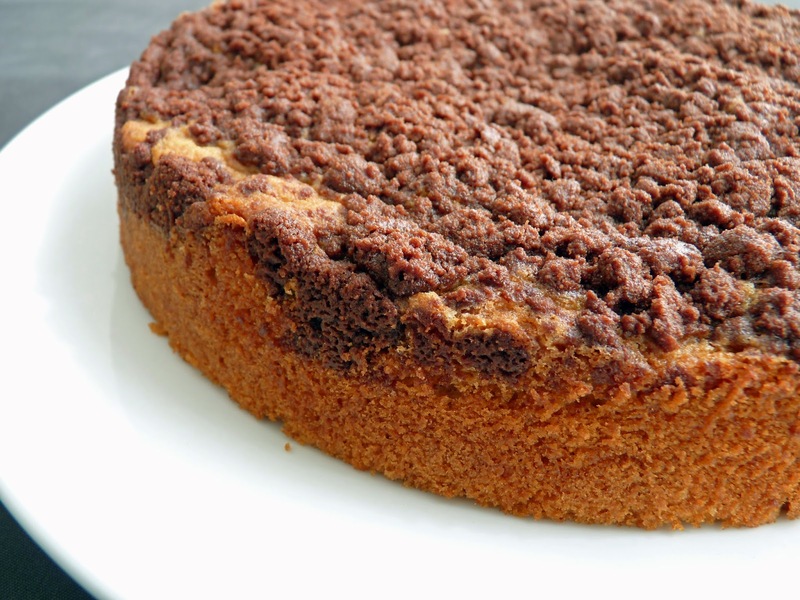 In the universe of coffee cakes, the crumb cake has its own orbit. There’s just something about those beautifully crisp buttery crumbs that compel us to reach for a slice. 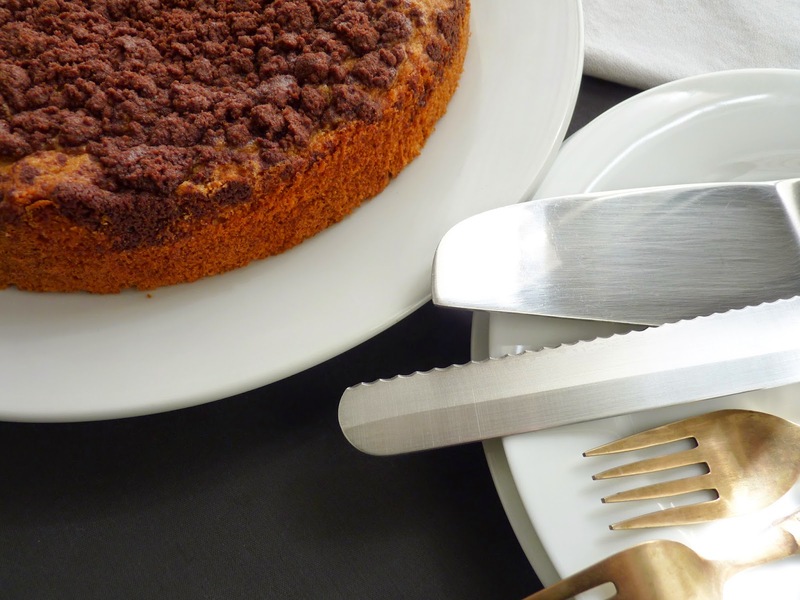 The origins may have come from the streuselkuchens of Germany but make no mistake, crumb cakes are very much a part of American baking culture as a result of the influx of immigrants to New York. Crumb cakes are by nature very simple. 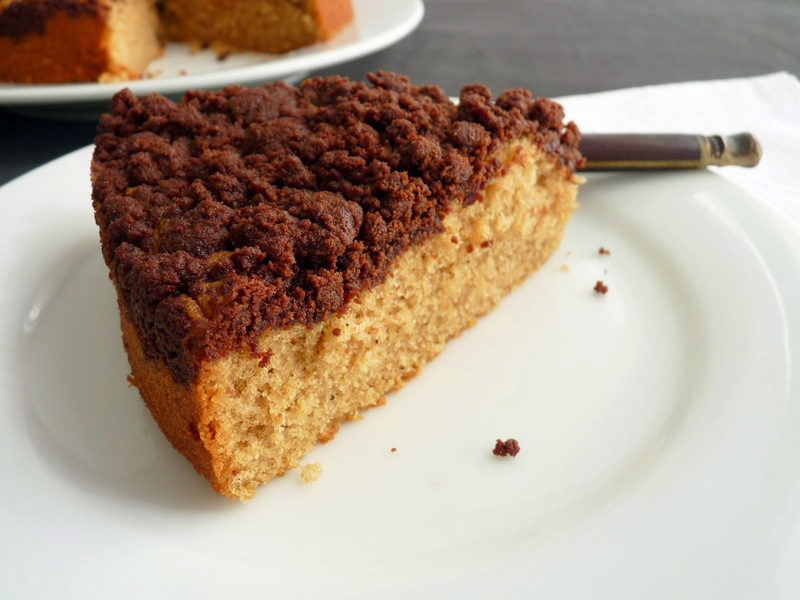 This one is an incredibly tender cake, thanks to the brown sugar, butter and milk that moisten and tenderize, resulting in really nice soft crumb. For something a little different, I took a slight detour and added cocoa powder to the crumb mixture. It’s a delicious change-up if chocolate is your trusty friend. This cake is super easy to pull together. 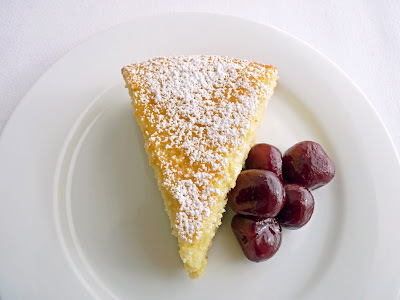 And since I always think of spring and summer as brunch season, you’ll want to add this recipe to your collection alongside all those other kugelhopf, bundt and streusel-laden gems. Let me assure you, the aroma of this cake baking in your kitchen is the best kind of morning wake-up call, impossible to resist. - I use my hands to mix the crumb topping. It takes about 3- 4 minutes because the brown sugar, flour and cocoa become a pretty fine powder when combined. But if you keep working it as directed, it comes together in nice clumps. - The salt in the crumb mixture is there to enhance the cocoa powder. - Room temperature butter is not oily or soft. It should give just a bit when you press a finger into the surface. - Cream butter and sugar on medium speed to avoid breaking the fragile air bubbles you’re trying to create. This is the stage where the texture and crumb are being developed. - A quick way to bring eggs to room temperature is to place them in a bowl of hot water for a few minutes. Cold eggs will impact the volume of the cake. - For cake mixing, always add eggs one at a time, mixing thoroughly before adding the next. The batter is ready for the second egg when it no longer has a shiny slick on the surface. - Scraping down the bowl of your mixer is crucial to thoroughly emulsifying the butter and egg mixture and then fully integrating all of the remaining ingredients. It may seem like a bother but it’s what helps to build the structure of your cake. - Don’t skip the allspice. Contrary to popular belief, allspice isn’t a blend of a lot of different spices. It’s actually the sun dried unripened berry of the Pimenta dioica plant. It's sometimes referred to as Jamaica Pepper because early spice explorers striking out to the New World believed they had discovered the black pepper they coveted. The term "allspice" is likely due to the fact that its aroma and flavor strongly suggest the flavors of cinnamon, nutmeg, black pepper and cloves. Allspice does contain a trace of eugenol, the essential oil that gives cloves their distinctive flavor. I often use allspice as a backnote to amplify other spices, especially cinnamon. It’s also a key ingredient in Caribbean jerk dishes. - My crumbs didn't dislodge when I turned out the cake. You can use a 9" springform pan if you prefer. - More brunch ideas on Pinterest. Preheat oven to 350 degrees F. Lightly grease a 9” x 2 1/2 “ cake pan and line the bottom with a circle of parchment paper. 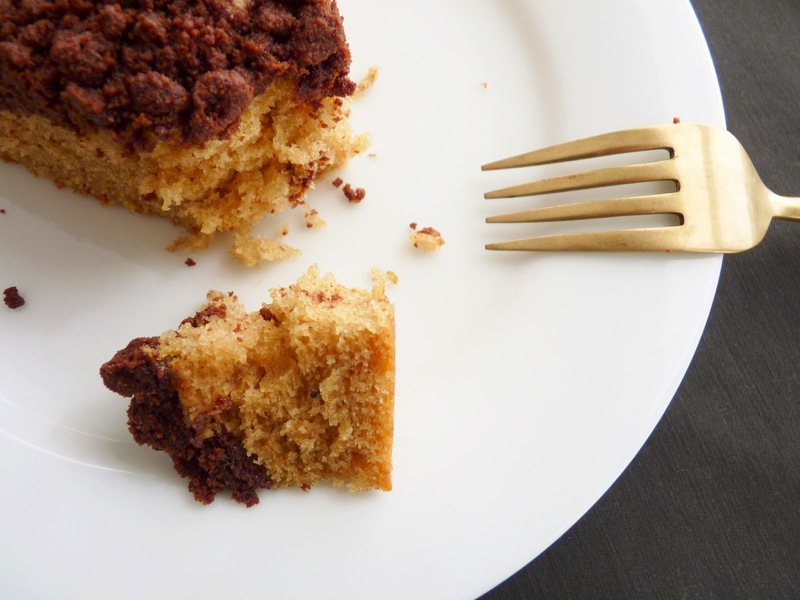 For the chocolate crumb, place the brown sugar, flour, cocoa, cinnamon and salt in a bowl. Stir together until it looks like a fine powder. Cut the cold butter into 1/4” pieces and toss with the cocoa mixture. Pinch the butter until it flattens into smaller pieces that resemble small peas. Then grab big handfuls of the mixture and squeeze it together until it begins to adhere into large compressed clumps. This will take about 3 – 4 minutes. Then take the large clumps and break them into smaller clumps. Chill until ready to use. For the cake, sift flour, baking powder, salt, cinnamon and allspice together and set aside. Cream butter and both sugars until light and fluffy, about 3 minutes, scraping down the sides of the bowl as needed. Add vanilla and blend. Beat in eggs one at a time, mixing thoroughly after each addition and scraping down the bowl as needed. Add a third of the flour mixture alternately with half the milk, beginning and ending with the flour. Scrape down bowl to be sure everything is incorporated. Pour the batter in the prepared pan and spread evenly. Cover the top of the cake batter with chocolate crumb mixture and gently press down just a tiny bit. 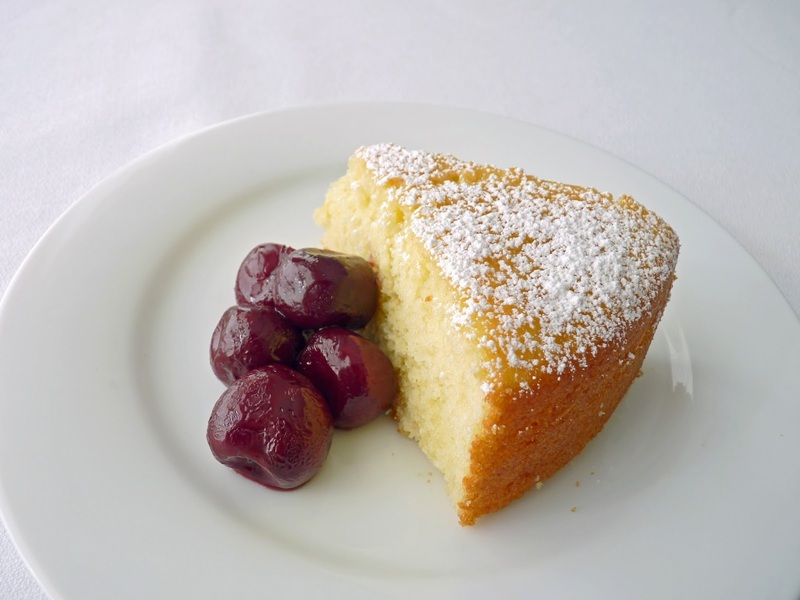 Bake until a tester inserted in the center of the cake comes out clean, about 30 – 32 minutes. Place on a wire rack to cool for about 15 minutes. Run a thin knife along the edges and invert the cake. Remove the parchment and turn the cake again so it’s right side up. Cool completely.